As far as melting cleansers go, I put this one in the middle of the pack. The minimalist but subtantial packaging and light, herby scent feel luxe and spa-like, so washing your face feels like a special ritual. 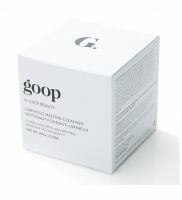 The cleanser is a solid balm that you really have to work between your hands to melt. It's more work than I'd care for (I guess I'm not that into rituals when I'm trying to get to bed). The...read more directions recommend using a face cloth to wipe away the cleanser, and you definitely need one to get all of it off. Still, it leaves my skin feeling soft and clean. I was not a fan of this at first, until I realized I was using it wrong. After one or two uses, I realized you're supposed to use a washcloth to remove the cleanser, and once I did, my results were fabulous. It removed all of my stubborn eye makeup, as well as my caked on foundation and bronzer. As it cleansed my skin it also infused it with serious hydration -- leaving my face soft to the touch immediately after. Love this cleansing balm.